The last time you walked into an art museum, you were probably greeted by oil paintings and marble sculptures, not a cluster of gymnastic rings, old-fashioned feather dusters, and whimsical swinging pendulums. 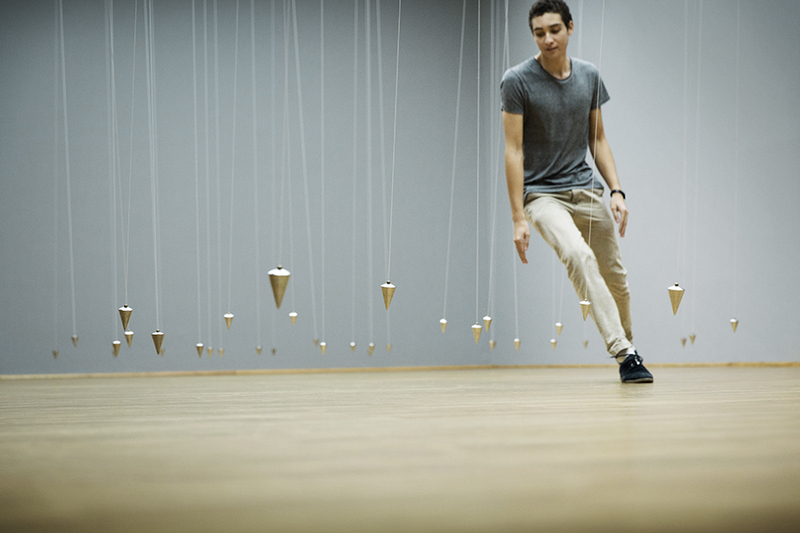 The Institute of Contemporary Art’s upcoming fall exhibit, William Forsythe’s “Choreographic Objects,” compels visitors to dodge, dance, and problem-solve their way through a series of room-sized exhibits, tactile sculptures, and video artwork featuring playful objects and curious instructions. Through his artwork, Forsythe insists that choreography—the practice of designing a sequence of physical movement—can be performed by anyone, regardless of their experience with dance. Even “the inherent movements we make every day can be seen as choreography,” explains Eva Respini, the ICA’s Barbara Lee Chief Curator. Forsythe, a former classical ballet dancer with the Stuttgart Ballet and director of Ballett Frankfurt in Germany, has worked in choreography for over 40 years, according to Respini. For the past 20 years, he has concurrently developed “Choreographic Objects.” In addition to his featured exhibit at the ICA this fall, he is also serving as a choreographer-in-residence with the Boston Ballet. One of these participatory demands appears in “Towards the Diagnostic Gaze” (2013). Etched on a shelf reads the instruction: “Hold the object absolutely still.” The object in this case is an antiquated feather duster. Frustratingly, no matter how hard you focus on holding the duster still, even the subtle thump of your heartbeat will make the seemingly weightless feathers twitch. Respini explains that Forsythe’s interest in heuristic models, or the learning of a new skill through trial and error, is an underlying force in his work. “He really thinks about the unique ways in which individuals find solutions to the problems that he’s proposing through these choreographic objects,” Respini says. 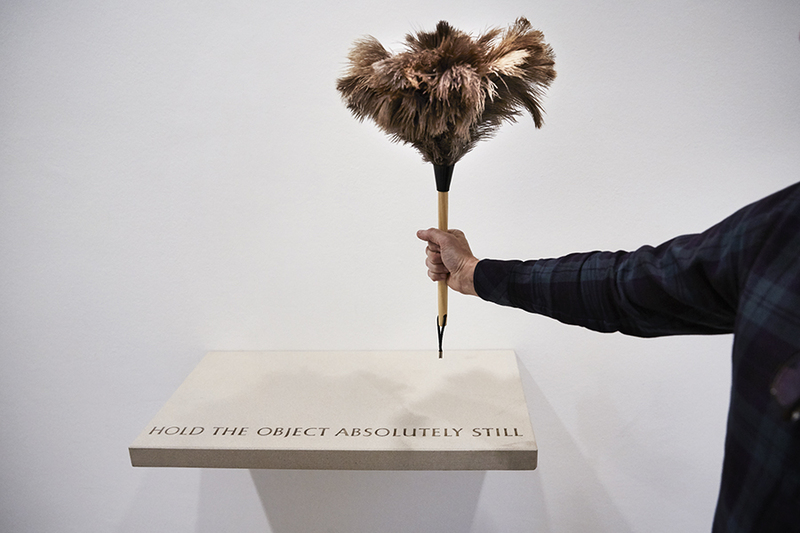 And in the case of the feather duster, people’s unwillingness to quit an apparently insurmountable task. “Even if it’s impossible, you still keep trying,” she says. While holding a feather duster completely still might not feel like choreography, it is an attempt at problem-solving, which is intimately connected with the study of movement. Plus, the artwork is fun to participate in as well as observe, particularly in the case of the room-sized installation “Nowhere and Everywhere at the Same Time, No. 3” (2015). The installation features a maze of hanging pendulums, each individually moved by a device installed in the ceiling. Visitors are instructed to navigate the room without touching a pendulum. Respini explains that if you do touch one, it’s okay. (Contrary to what most museums would have you believe about touching the artwork.) But what arises from the exploit is the individual’s own dance, or choreography, made up of their ordinary movements as they dodge the swinging pendulums. Throughout the exhibit, visitors can expect to interact with everything from a sea of gymnastic rings spattered at different heights in “The Fact of Matter” (2009) to a wall of video screens that play back a distorted version of your movements in “City of Abstracts” (2005). In addition to the interactive aspects of Forsythe’s “Choreographic Objects,” there are also a number of video works exploring the perplexing capabilities of human movement. In a variety of formats, Forsythe’s work examines his driving question: “What could physical thinking look like?” After a day spent jumping, climbing and swinging, the answer is clear: physical thinking looks like choreography. October 31, 2018 through February 21, 2019, Institute of Contemporary Art / Boston, 25 Harbor Shore Drive, Boston, icaboston.org.